K Jayaganesh’s story is similar. He failed the civil service examination six times but never lost heart. The seventh time — his last chance — he passed with a rank of 156 and has been selected for the Indian Administrative Service. 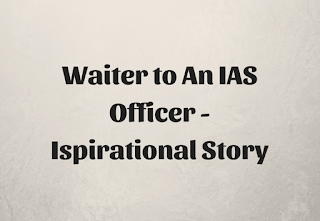 Jayaganesh’s story is inspiring not because he did not lose heart but also because he comes from a very poor background in a village in Tamil Nadu, and though he studied to be an engineer, he worked at odd jobs, even as a waiter for a short while, to realise his dream of becoming an IAS officer. I was born and brought up in a small village called Vinavamangalam in Vellore district. My father Krishnan, who had studied up to the tenth standard, worked as a supervisor in a leather factory. My mother was a housewife. I am the eldest in the family and have two sisters and a brother. I studied up to the 8th standard in the village school and completed my schooling in a nearby town. I was quite good at studies and always stood first. Coming from a poor family, I had only one ambition in life — to get a job as fast as I could and help my father in running the family. My father got Rs 4,500 as salary and he had to take care of the education of four children and run the family, which you know is very difficult. So, after my 10th standard, I joined a polytechnic college because I was told I would get a job the moment I passed out from there. When I passed out with 91 per cent, there was a chance for me to get entry to a government engineering college on merit. So I decided to join the Thanthai Periyar Government Engineering College to study mechanical engineering. My father supported my desire to study further. Even while doing engineering, my ambition was still to get a job. If you look at my background, you will understand why I didn’t have any big ambitions. Most of my friends in the village had studied only up to the 10th standard, and many did not even complete school. They worked as auto drivers or coolies or masons. I was the only one among my friends who went to college. I understood the importance of education because of my parents. My father was the only one in his family to have completed school, so he knew the value of education. My parents saw to it that we children studied well. Four days after I completed my engineering in 2000, I went to Bangalore in search of a job and I one without much difficulty. My salary was Rs 2,500 at a company that reconditioned tools. It was in Bangalore that I started thinking about my village and my friends. I wondered sadly why none of them studied and worked in good companies. Because they had no education, they always remained poor. There was not enough money to buy even proper food. There was no opportunity there; the only place they could work was the tannery in the nearby town. If they didn’t get work at the tannery, they worked as auto drivers or coolies. In short, there was no one in my village to guide the young generation. I thought would I be able to help my villagers in any way? Till then, I had not even heard of something called the civil services examination. It was only after I went to Bangalore and saw the world that I was exposed to many things. I came to know that a collector in a small place could do a lot. At that moment, I decided that I wanted to be an IAS officer. I resigned and went home to prepare for the examination. I never thought resigning was risky because I had the confidence and knew I would do well. My father also supported me wholeheartedly. He had just got a bonus of Rs 6,500 and he gave me that money to buy study material. I sat in my village and studied from the notes I received by post from Chennai. In my first two attempts, I could not even clear the preliminary examination. I had no idea how to prepare for the exam, what subjects to opt for and how to study. There was nobody to guide me. I had taken mechanical engineering as my main subject. That’s when I met Uma Surya in Vellore. He was also preparing for the examination. He told me that if I took sociology as an option, it would be easy. Even with sociology as the main subject, I failed in the third attempt. But I was not disappointed. I knew why I was failing. I didn’t have proper guidance. I started reading newspapers only after I started preparing for the examination! So you can imagine from what kind of background I came from. When I came to know about the government coaching centre (external link) in Chennai, I wrote the entrance examination and was selected. We were given accommodation and training. Because I got tips from those who passed out, I passed the preliminary in my fourth attempt. We were given free accommodation and food only till we wrote the main examination. After that, we had to move out. I didn’t want to go back to the village but staying in Chennai also was expensive. I tried to get a job as an engineer but my efforts turned futile. I then decided to look for a part time job so that I would have time to study. I got a job as a billing clerk for computer billing in the canteen at Sathyam Cinemas. I also worked as the server during the interval. It never bothered me that I, a mechanical engineer, preparing for the civil services, had to work as a server. I had only one aim — to stay on in Chennai to pass the examination. After I got the job at the Sathyam Cinemas, I was called for the interview. As counselling was my hobby, a lot of questions were asked about counselling. I was not very fluent in English but I managed to convey whatever I wanted to. Perhaps I did not articulate well. I failed in the interview. Once again, I started from the beginning. Surprisingly, I failed in the preliminary itself. On analysis, I felt I did not concentrate on studies as I was working at Sathyam Cinemas. I quit the job and joined a private firm to teach sociology to those preparing for the UPSC examinations. While I learnt the other subjects there, I taught sociology. Many friends of mine in Chennai helped me both financially and otherwise while I prepared for the examination. I passed both the preliminary and the main in the sixth attempt but failed at the interview stage. While preparing for the interview, I had written an examination to be an officer with the Intelligence Bureau and I was selected. I was in a dilemma whether to accept the job. I felt if I joined the IB, once again, my preparation to be an IAS officer would get affected. So, I decided not to join and started preparing for one last time. I had to give the last preliminary just a few days after the previous interview. I was confused and scared. Finally, I decided to take the last chance and write the examination. Like I had hoped, I passed both the preliminary and the main. The interview was in April, 2008 at Delhi. I was asked about Tamil Nadu, Kamaraj, Periyar, Tamil as a classical language, the link between politics and Tamil cinema etc. I was upset since I did not wish the interviewers at the start and they did not respond when I said thanks at the end. Both the incidents went on playing in my mind. I just prayed to God and walked back. I was extremely tense that day. I would know whether my dreams would be realised or not. I used to tell God, please let me pass if you feel I am worthy of it. I went to a playground and sat there meditating for a while. Then, I started thinking what I should do if I passed and what I should do if I didn’t. I had only one dream for the last seven years and that was to be an IAS officer. Finally when the results came, I couldn’t believe myself. I had secured the 156th rank out of more than 700 selected candidates. It’s a top rank and I am sure to get into the IAS. I felt like I had a won a war that had been going on for many years. I felt free and relieved. The first thing I did was call my friends in Chennai and then my parents to convey the good news. The reception I got in my village was unbelievable. All my friends, and the entire village, were waiting for me when I alighted from the bus. They garlanded me, burst crackers, played music and took me around the village on their shoulders. The entire village came to my house to wish me. That was when I saw unity among my villagers. It was a defining moment for me. I worked really hard without losing faith in myself to realise my dream. My real work starts now. I want to try hard to eradicate poverty and spread the message of education to all people. Education is the best tool to eradicate poverty. I want Tamil Nadu. 1) not to lose hope- After failing five times he still sat for the exam the sixth time. 2) Tremendous self belief- Any ordinary person would have grabbed the chance to become become the IB offcier after the 5th attempt but Jayaganesh wanted to be a civil servant. 3) Passion- Jayaganesh did not hesitate to work as a waiter inspie of being a mech. engineer in his quest for the final goal.